Home International IAAF World Relays Can Team Nigeria retain the women’s 4x200m World Relays title? 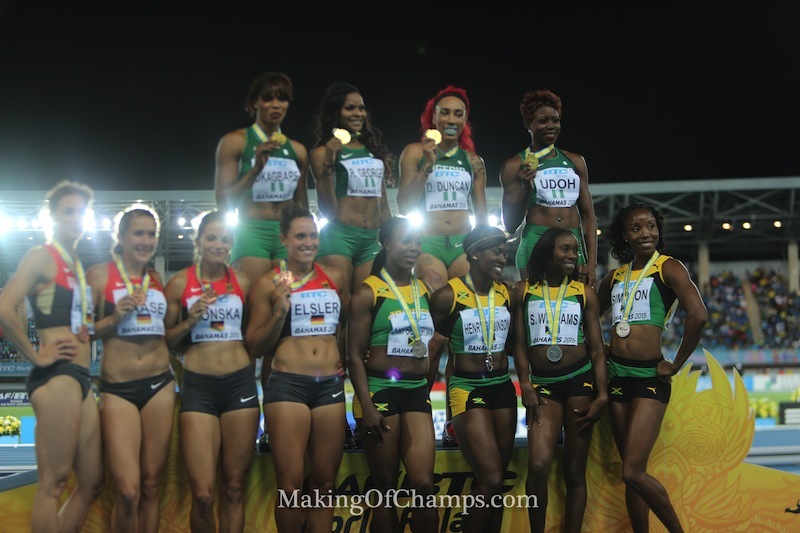 It’s time once again for the IAAF World Relays, with various countries around the world converging in the Caribbean nation of the Bahamas to jostle for honours between April 22 and 23, whilst seeking for automatic relay spots for the 2017 World Championships in London. 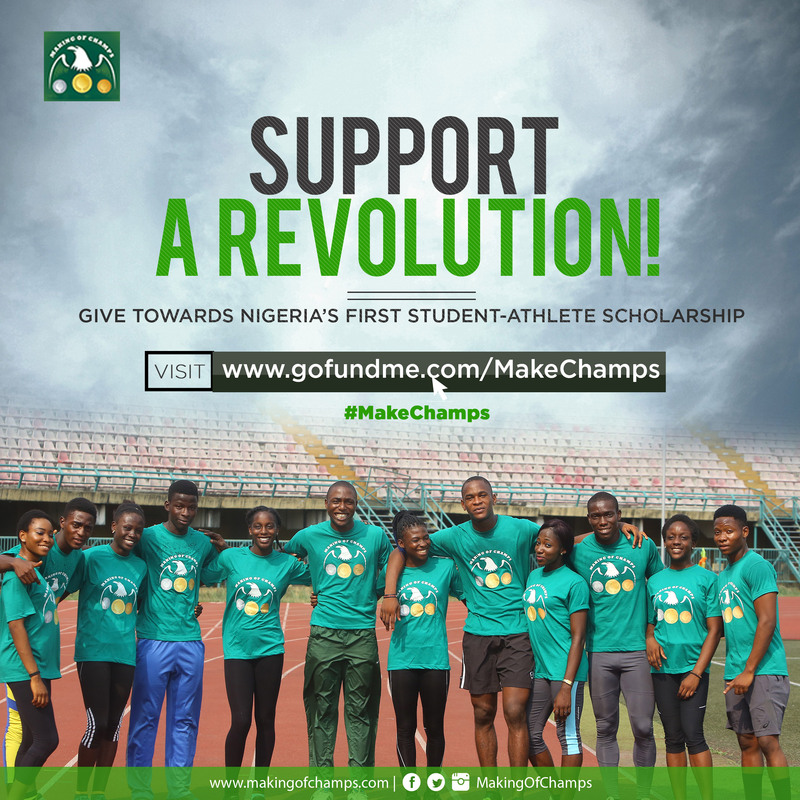 Team Nigeria will not be left out in this quest, as the country has registered teams in the women’s 4x100m, 4x200m and 4x400m events, whilst their male counterparts would be absent in Nassau as they weren’t entered for the competition by the Athletics Federation of Nigeria (AFN). 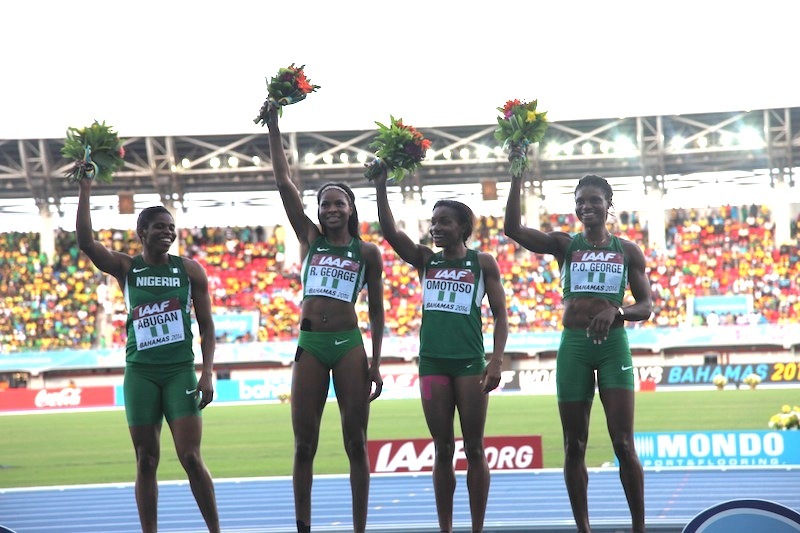 The women teams have enjoyed significant success since the inaugural edition of the IAAF World Relays in 2014 where the quartet of Sade Abugan, Regina George, Omolara Omotosho and Patience Okon-George clocked a stunning time of 3:23.41 in the 4x400m to bring the Bronze medal home for the country. Their feat was an astounding one because it was the first global relay medal for Team Nigeria since the Beijing 2008 Olympics, and their time became the 3rd fastest ever in the history of the women’s 4x400m for the country. Only the Silver medal winning team of Atlanta 1996 (African Record at 3:21.04) and Sydney 2000 team (3:22.99) have clocked faster times. Not resting on their oars, the 2015 edition proved to be much better for the team as the quartet of Blessing Okagbare, George, Dominique Duncan and Christy Udoh set a new National Record (NR) of 1:30.52 to be crowned the World 4x200m Champions, finishing ahead of power houses Jamaica and USA who were favourites for the win. It was a surprise to many Athletics fans considering Jamaica had renowned sprinters in Veronica Campbell-Brown and Sherone Simpson in their team, while USA who led from the start of the race until the final hand-off, could not finish due to a faulty baton exchange between the incoming third leg runner, Jeneba Tarmoh and anchor leg, Allyson Felix. 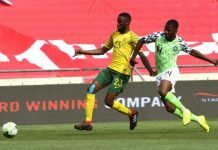 The Nigerian team capitalised on this advantage, but Team USA will be hoping to avoid the same mistake this time around, while Jamaica will aim to avoid another upset. 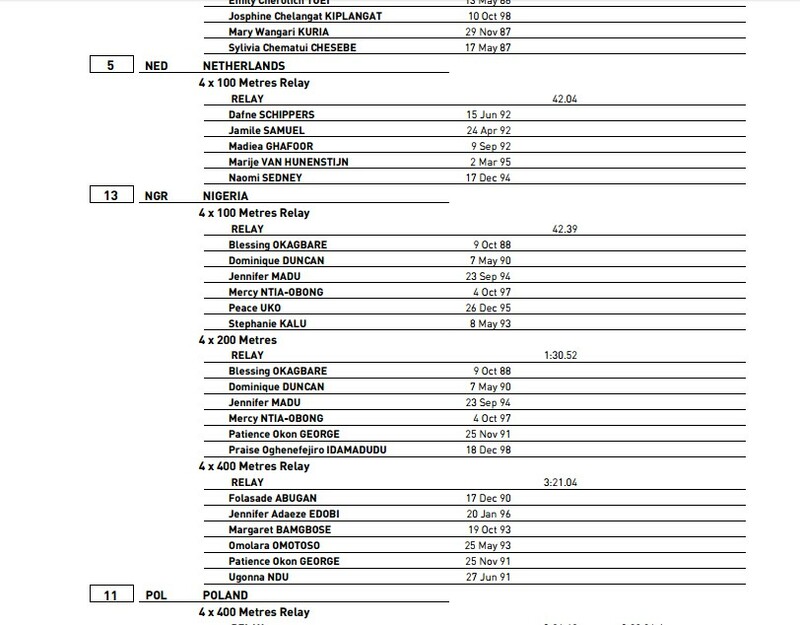 That notwithstanding, the question that’ll be on the lips of Athletics pundits and Nigerian fans alike will be: Can Team Nigeria retain the women’s 4x200m title? 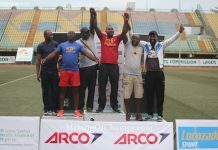 This will be an arduous task for the four-man team registered by the AFN to execute this race at the 3rd edition of the World Relays. 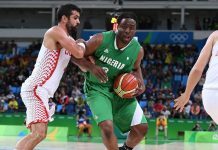 The team comprises of defending champions Okagbare and Duncan, while Okon-George and Jennifer Madu were also drafted into the squad. The 2017 World Relays will be Okagbare’s first outing this year, and fans will be hoping to see her put up an outstanding show after a rather challenging 2016 season. Duncan wasn’t in action for Nigeria in 2016 and it remains to be seen how well she will kick-off her outdoor season. 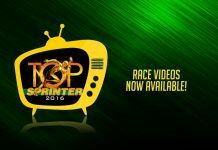 Okon-George is the reigning National 400m Champion, but she hasn’t yet proven her mettle over the 200m internationally. Madu was part of the 4x100m team that got to the finals of the Rio Olympics last year, but just like Okon-George, her 200m strength is unknown to many. 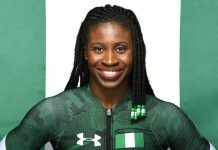 Home-based athletes Mercy Ntiaobong and Praise Idamadudu were initially listed to compete in the 4x200m. However, the pair will be missing in action in Nassau after being dropped by the AFN. 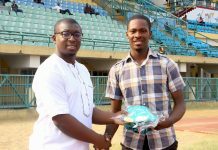 The same fate befell their colleagues Peace Uko (4x100m), and Omotosho and Abugan who were to race in the 4x400m. Will the Nigerian team be strong enough to upset the Jamaican squad that has Rio 2016 Double Olympic Champion, Elaine Thompson and Campbell-Brown in their pack, or the US team that will be banking on Olympic 200m Bronze medallist, Tori Bowie amongst others? Or should the team be hoping on mother-luck to be on her side once again? 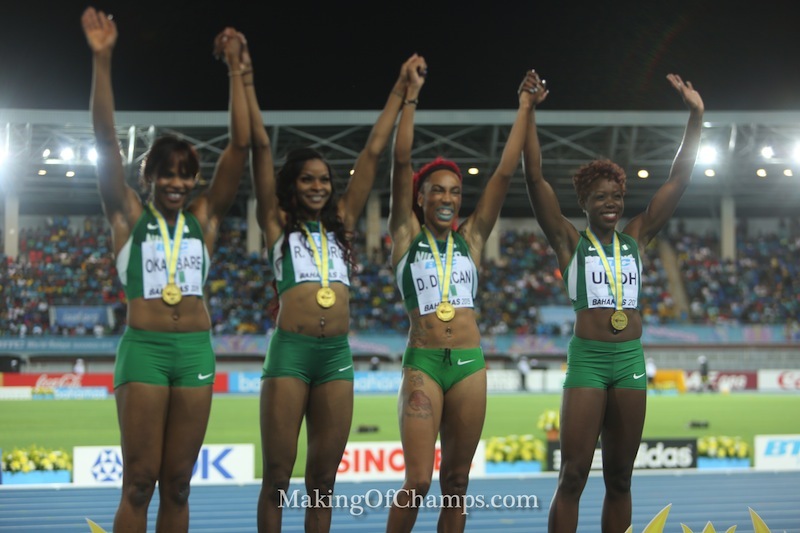 At the 2015 World Relays, Nigeria 4x100m women’s team secured an automatic qualification for Rio 2016 Olympics. 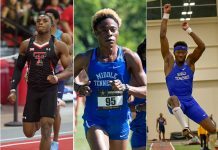 Asides from retaining the 4x200m title, the 4x100m and 4x400m teams will be aiming to at least make the final in their events in order to gain automatic qualifying spots for the World Championships later in August. The 4x100m are the only Nigerian women’s team yet to win a medal at the World Relays, with their previous performance earning them a 7th place finish in the final, after clocking 42.99s. 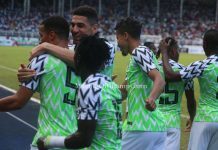 The quartet of Okagbare, Duncan, Madu and new addition Stephanie Kalu are expected to don the colours of the country in this event and will be hoping to get their hands on a medal. 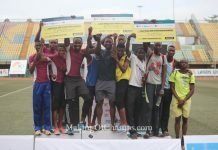 Also, the 4x400m team will be hoping to pose a threat to their rivals considering their brilliant performance from three years ago. It is left to be seen how the team will fair, with George being excluded from the team. 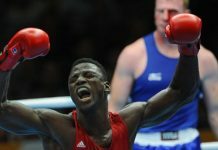 Okon George is expected to be the major game changer, while newbies Margaret Bamgbose, Jennifer Edobi and Ugonna Ndu will all be aiming to make an impact in order to improve on the Bronze winning performance from 2014. Without doubt, the country’s female teams have the hopes of millions on their shoulders, especially in the absence of their male counterparts. It would be great to see them hold their own against the best countries in the world.